High level of equipment, completely renovated. Comfortable studio in a refurbished mountain atmosphere with dishwasher and television. Located on the 1st floor of a renovated residence, very calm with elevator. Start skiing in front in the heart of the resort facing the ski school. Preferential tariffs on ESF lessons and rentals of equipment. In summer, you will be in the heart of lush greenery. Sleeping: Sleeping 2 people very good on bench BZ (mattress in one piece). 2 bunk beds 90 can be isolated by a sliding partition. Bathrooms: Bathroom equipped with bathtub and sink. Bars to extend the combinations and plenty of storage. 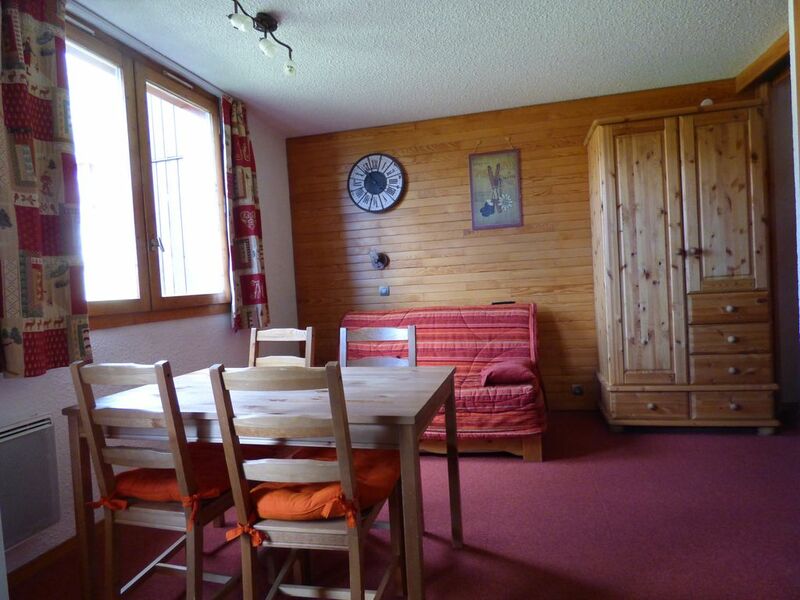 Dishwasher, microwave-grill, coffee maker, kettle, crockery for 4 people, fondue set, toaster. Overall, a lovely apartment, well equipped, clean, warm and great access to the local facilities and slopes. Belle Plagne is a lovely village for skiing from and from this apartment we had easy access to everything we needed including shops, ski hire, ski school and restaurants. Great option to be able to ski to and from the front or back of the building. Slightly draughty window, but not a major issue. Everything worked well in the apartment although some sharp kitchen knives and a pair of scissors would have been useful. Easy booking process and good communication throughout. Logement très propre, pratique, avec une déco "montagne" sympa et surtout avec une situation idéale pour le ski. Pistes de ski au pied et commerces chaleureux à deux pas avec un environnement sans voitures puisqu'elles sont garées dans les parkings sous les pistes et résidences. Très bien pensé ! On peut profiter d'un grand domaine skiable tout en étant logé dans un petit village respectueux de l'environnement naturel . Endroit agréable, calme ...très typique !!! Commerce à proximité et sympathie des commerçants!! Nous avons beaucoup apprécié notre repas au Matafan … personnel sympathique et souriant ..les plats délicieux..
Nous vous conseillons cette station. beau logement .très bien placé .dommage d' arriver à 18 h dans un logement non chauffé quand il fait 0 dehors ! !pas très accueillant ! Je suis contente que l'appartement vous ait plu. Habituellement nous faisons en sorte qu'il soit chauffé avant l'arrivée des premiers locataires. Je suis surprise que cela n'ait pas été fait. Je vais me rapprocher du service de conciergerie afin que ça ne se renouvelle plus. Merci de m'en avoir informée et désolée pour ce désagrément. The apartment is on the first floor of Aigue Marine and can be reached by lift or stairs. On arrival it is best to use the 2 hour free parking and park undreground near the Aigue Marine entry (the landlord provides the building entry code once your booking is paid and confirmed). Once unpacked you will need to find either an underground parking or outdoor parking and pay the week's charges at the Information Centre. Approximately €80 a week for underground and €40 for outdoor parking for the week. Try and arrive before the rush on Saturdays to ensure you can get an underground parking. The apartment has fully equipped kitchen with microwave/grill, coffee maker, toaster, kettle etc. The bathroom has a bath and shower attachment but no hook on the wall to use with the shower (but then nothing beats a long soak in the tub after a days skiing). The TV has several channels in English and kept our two children aged 4 and 6 occupied in the evenings once they had finished skiing and sledging. There are gd floor ski lockers which allows you to ski in and out through the rear of the building which leads down to the nearby chairlift and to Bellecote. We liaised with a lovely lady at the Tabac regarding the collection of the apartment keys and locker keys and thoroughly enjoyed our stay at the apartment. The owner was a pleasure to deal with an it was great being able to pay online and communicate direct via email. There is a SPAR, bakery and other shops within a short walk (sometimes best to use the underground route!). There are several ski equipment rental shops and restaurants. For the restaurants it is often best to check and make a booking as some do not have capacity for walk in guests most evenings due to high demand. We got pizzas one evening ffy the Cheyenne restaurant and their are rotisserie chickens available from two other locations. There are lots of great blue ski runs and the cable car from either Belle Plagne or Bellecote take you to Roche di Mio where there are several great blue/red runs (nothing too difficult). If you want a challenge try going up to the glacier or skiing to the nearby resorts which are all linked by ski lifts. A great apartment for families with young children. Close to Moutiers and Bourg ST Maurice, located at 2050 meters altitude.